I am designing again. I’ve had no shortage of ideas accumulating in corners of my brain and in various notebooks, but since the last year of the PhD pretty much sucked out most of the creative energy, time, and confidence that I had lying around, I haven’t been acting on many of them. And then, of course, I get about 4 inches into one project and immediately my self-conscious starts with the questions. Why did I choose this yarn? Did I buy enough? What if I didn’t get enough? What if I can never find any more of Araucania Ranco PT496 ever again? (Subquestion: why is it called PT496? Surely there must be a real name? Why does said real name fail to appear on the label?) Why the hell did I have to start these as knee socks anyway? Regular short socks would never be causing me these problems, right? And for that matter why can I no longer do math? Why have I mis-counted the # of calf stitches approximately five times already? Will I be able to read my pencil scribblings at the end of all of this? Why didn’t I start in with the sweater idea instead? I think I’ll start a countdown to weekend happy hour. I’ve just finished a stint of designing and all I can say is I understand and share your pain. Truly. *hugs* All will work out though. I haven’t designed a lot of knitting patterns, but as a graphic designer, I would say: Never underestimate the thinking power of your subconscious. This may be the perfect time to do a few swatches for that sweater, letting your subconscious work out your sock problem. Good luck on the designs– I’m sure they’ll be fab! Good idea, that count down to happy hour. In the meantime, just breathe… pet your swatches… you can count those stitches again later… you design because you really, truly, bottom line love it. I’m having a little drool fest over those colours in that sock yarn, yum. Happy hour! Is that tonight? For me it is! It’s scary how sometimes knitting seems like a big leap. I thought I was supposed to be able to control everything?? But I’d like to echo Jen’s comment–it’s gotta be easier sometimes to let your subconscious percolate around it rather than thinking it through too much. Looks pretty though! Man, I wish they wouldn’t use those alphanumeric names for yarn colors. “Bronze” and “Bluebell” and “Cotton Candy” always sound so much cooler. My foray into designing has been little custom-made projects, like socks for my son, my entry for the MDK project runway, that sort of thing. I’ve thought about trying to design a sweater (I actually have a couple neat ideas), but I have NO idea about sizing! Where do you even start? It amazes me that people can do it at all. I once checked out the Deborah Newton book on sweater design and there was so much info it made my head spin. Good luck. The yarn is gorgeous and I can’t wait to see when it’s all knit up! Why? Well, “Why not?” *laugh* Can’t wait to see the project all completed. All of that makes you a great designer! Congratulations! Do your swatches purr when you pet them? I love your designs, Martha. I’m sure the socks will be awesome, you’ll have enough yarn, and theat forthcoming sweater idea will be brilliant. Don’t let that self-doubt get to you! I hear you on alpanumeric code names- Is it that hard to name a yarn ‘sea glass’ or ‘picasso’s blue period’? Come on!! 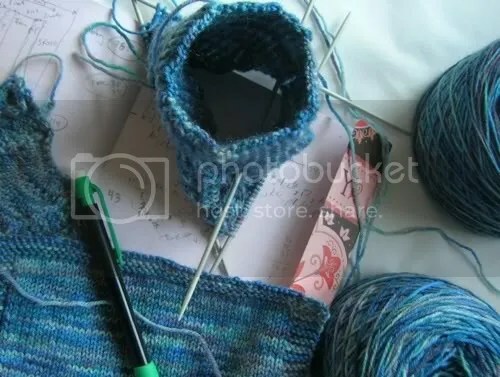 The blue yarn is very pretty, I’m sure your socks will be gorgeous. My designing often seems to be a start-stop process. I do a bit then I need to do something mindless while I work through the next step. I look forward to seeing the fruits of your designing. I am trying to write up a pattern at the moment and everytime I knit a sample I change something … I could be a while!!! You’re created great designs in the past, so I’m sure that whatever you end up with this time around will be good too. Just let your creativity guide you and it will be fine!